Most shapes can be fitted together to tile a plane, either singly or in conjunction with others; the familiar patterns of a tiled floor or a bee's honeycomb are just two examples. But these are periodic; the pattern repeats at regular intervals, and any part of the pattern looks much the same as any other. There are other sets of shapes which will also tile the plane, but only non-periodically: the pattern looks totally random, with any part of it looking somewhat similar yet never quite the same as any other. There are many examples of these, but perhaps the simplest to understand and use is the set of six devised by Raphael Robinson in 1971, a considerable improvement over the first set of 20,426 tiles(!) found by Robert Berger in 1966. Although I have no doubt that there is much other material out there concerning these tiles, most of this information is from Roger Penrose's book "The Emperor's New Mind", where he describes non-periodic tiling in general and these tiles in particular. He also describes his own set of six tiles, far more irregular and less amenable to simple drawing. 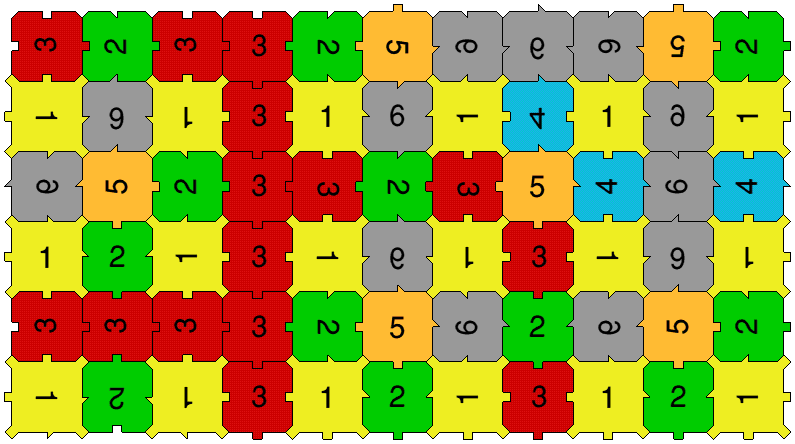 The pattern above is drawn with Robinson's six tiles (of course, rotating and flipping the tiles is permitted, as long as the correct edges fit together). You can view a higher resolution version (17K PNG). A 5×5 pattern is easy, while it is just about possible to construct a pattern of the size above by hand. But anything bigger is impossible (unless you are blessed with infinite patience). Some time ago I wrote a program (in C for RiscOS) to find tilings of any arbitrary size using a backtracking method, which managed to produce some quite substantial patterns (given sufficient time). Unfortunately, I've now lost the program... but if I ever find it again, or get around to rewriting it, it will of course appear on this page. There are many other unsolved problems and investigations concerned with tiling. One famous unsolved problem is whether there is a single tile which will only tile the plane non-periodically; the "versatile" that Penrose mentions can obviously do so, but fails to qualify because it can also be tiled in a periodic pattern. Of course, if all this irregularity is too much for you then you may want to look at GridPro, which can easily produce regular tesselations (among other things) from sprites or Draw files.